Discovering the true potential of an industrial mineral deposit is no small challenge. ArrMaz’s metallurgical lab has the experience and expertise to test new chemistries on your mineral deposit to help you understand its true value. 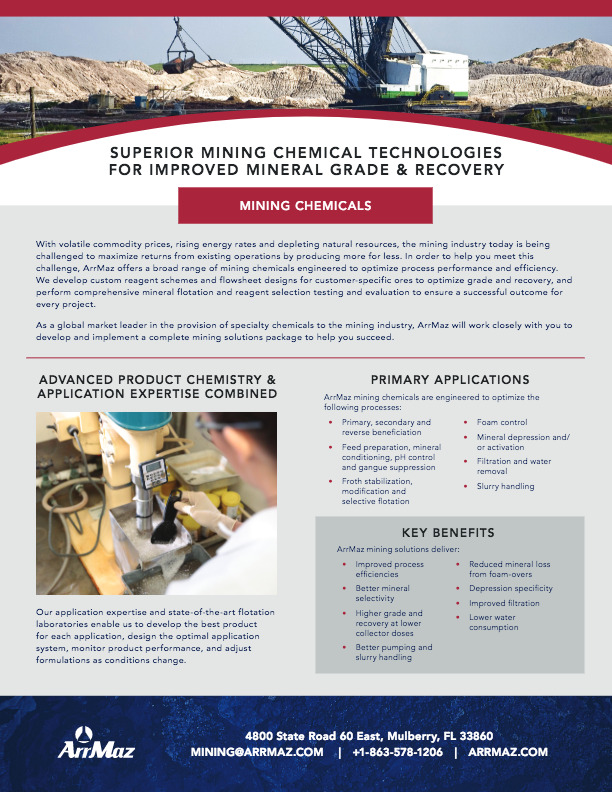 We will work with you to develop the best mining chemicals to maximize grade and recovery while optimizing your existing or new operations. We specialize in innovating new mineral beneficiation schemes which blend established methods with innovative flotation techniques to achieve optimal results. Our broad range of mining chemicals include flotation reagents such as anionic and cationic collectors, frothers and surfactants, defoamers, float oils, flocculants, pH modifiers and more. Whether it be direct or reverse, primary, secondary or cleaner flotation, ArrMaz has the mining chemicals to support your operation from the beginning during the feasibility study, to the end during plant commissioning. Our mining chemicals are tailor-made for each customer’s unique ore and operational scenario, and are compliant with all applicable industry regulatory requirements. Our application expertise and state-of-the-art flotation laboratories around the world enable us to develop the best product for each mineral type, design the optimal application system, monitor product performance, and adjust formulations as needed over time. This allows us to maximize the grade of the product and the amount of ore recovered through the flotation process. ArrMaz’s expert field personnel are also available as process advisors to our customers’ engineers, production managers and operations personnel to help you optimize your process.